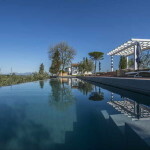 Tuscan Villa dating back to the 17th century which has been fully restored. Unrestored annexes give the opportunity to expand the accommodation of this super Tuscan villa, which also has pool, land and vineyard. Located just a few km from a small town this Tuscan villa is halfway between Arezzo and Florence, both about 45 minutes away. The nearest town, where there are some essential services, is located just 2 km away, while the town of Castelfranco di Sopra lies about 5 km away. 25 km from here, heading east you will find the Pratomagno and the abbey of Vallombrosa. 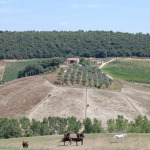 In the west are located the Chianti hills, bordering the edge of the Chianti Classico region, as well as Gaiole in Chianti (40 minutes). In about 30 minutes you can find the Outlet, selling leading fashion brands. The villa is on four levels, disposed as follows. Ground floor: entrance, kitchen, study, two bedrooms, bathroom, utility room, boiler room, lounge, study, dining room, cellar and tool shed. 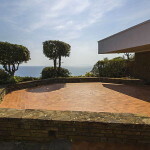 First floor: kitchen, dining, living room, veranda with panoramic windows and stone columns, six bedrooms, two bathrooms. Second floor: living room, kitchen, utility room, two bedrooms, bathroom. The floors are with terracotta and ceilings with wooden beams and terracotta tiles. 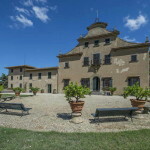 The property is completed by three annexes to recover, a two-hectare park with swimming pool and two hectares of vineyard. The flower garden planted with geraniums in clay pots and trees that surround the property provide a wonderful sense of privacy. 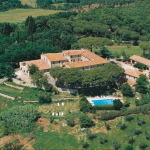 TYPE Tuscan Villa dating back to 17th Century with annexes and land with vineyard. LOCATION Open and sunny position. FEATURES Ancient construction, terracotta flooring, ceilings with wooden beams and terracotta tiles, old stone fireplace. LAND 4 hectares (10 acres) with 2 hectares of park and 2 hectares of vineyard. GARDEN Yes: 2 hectares of park . ANNEX Yes: three annexes to be restored. POOL Yes: 6 x 14 m.
Nearest town with services (2km; 5’); Castelfranco di Sopra (5km; 8’); Figline Valdarno (8km; 15’); Firenze (43km; 46’); Arezzo (49km; 46’); Cortona (71km; 1h 11’); Siena (71km; 1h 18’); Montepulciano (82km; 1 h 9’); San Gimignano (82km; 1h 15’); Montalcino (111km; 1h 37’); Perugia (125km; 1h 31’); Gubbio (137km; 1h 57’); Spello (150km; 1h 44’); Todi (164km; 1h 51’). Firenze Peretola (52km; 46’); Perugia Sant’Egidio (132km; 1h 35’); Bologna Marconi (143km; 1 h 35’); Roma Ciampino (262km; 2h 36’); Roma Fiumicino (237km; 2h 27’). Plot Size: 40000 m² Living Area: 1000 m² Parking: Yes Property: Ancient construction, terracotta flooring, ceilings with wooden beams and terracotta tiles, old stone fireplace.